Are you a typical American? Americans spend 43% of their food budgets eating out or getting take-out. What if for one month you got the entire family involved in meal planning, shopping, and food prep. Give the kids a cookbook and let them choose the menu and write the shopping list. When my sister and I were kids we enjoyed, Betty Crocker's Boys and Girls Cookbook. We made fun, easy recipes. Our boys loved Roald Dahl's books. 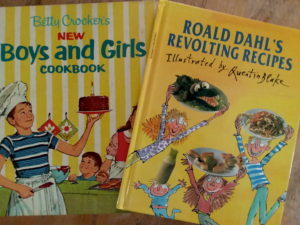 They recreated the recipes from Roald Dahl's Revolting Recipes cookbook. Your family will share delicious meals and quality time together. Cooking at home is healthier, less expensive, and fun. Two burger chains, Shake Shack and BurgerFi, serve beef without the routine use of antibiotics. These are the only two restaurants to earn an “A” on the Chain Reaction scorecard. This is the fourth annual scorecard released by six major consumer and environmental organizations. 22 of the top 25, including McDonalds got an “F” grade because they don't have a policy restricting antibiotic use in their beef. Public health experts warn that the widespread use of antibiotics in meat production is rendering antibiotics less effective by creating drug-resistant bacteria. Better yet, eat organic, grass-fed meat at home! Meat Recalls According to a report by U.S. Public Interest Research Group, recalls of beef, pork and chicken rose by 83% over the past five years. More than 128,000 people are hospitalized and 3,000 die from food-borne illness every year.